They were like paired birds of Franciscan brown. If Brother Julian was gardening in front of the friary, Brother Adrian weeded in the back. If Adrian was driving the van, Julian sat by his side. Preparing the altar for chapel, chopping wood for kindling, exulting in ice cream at the Twist & Shake, the identical Riester twins were together, always. 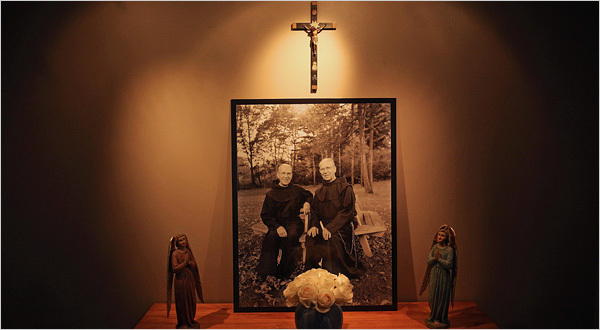 For many years at my alma mater, St. Bonaventure University, these simple men were workers, not teachers, and so ever-present in the pastoral setting as to be unseen. Taken for granted, like the rushing hush of the Allegheny River at the university’s edge, or the back-and-forth of the birdsong in the surrounding trees. Two weeks ago, the twins died on the same day in a Florida hospital; they were 92. Brother Julian died in the morning and Brother Adrian died in the evening, after being told of Julian’s death. Few who knew them were surprised, and many were relieved, as it would have been hard to imagine one surviving without the other.